On first look, the MV-22 Osprey may seem like something from the imagination of a small child. The wide body, wings, and giant rotors make for a unique and versatile aircraft. The Osprey isn’t simply an upgrade on an older aircraft, but it is completely new. Part helicopter and part plane, the Osprey is a tilt-rotor, short take-off and vertical landing (STOVL) aircraft. The versatility of the Osprey allows it to be deployed in a number of different roles including air support, troop deployment, casualty evacuation, and search and rescue missions. Often deployed on Wasp-class carriers, the Osprey is most commonly used for delivering troops and equipment to military bases. In addition to a crew of four, the Osprey can transport twenty-four Marines with gear or up to 24,000 pounds of cargo. The aircraft can also deliver an M1163 fast attack vehicle that tows the M327 120mm heavy mortar. These capabilities are useful in places like Iraq and Afghanistan where mobility over long distances is key to the mission. 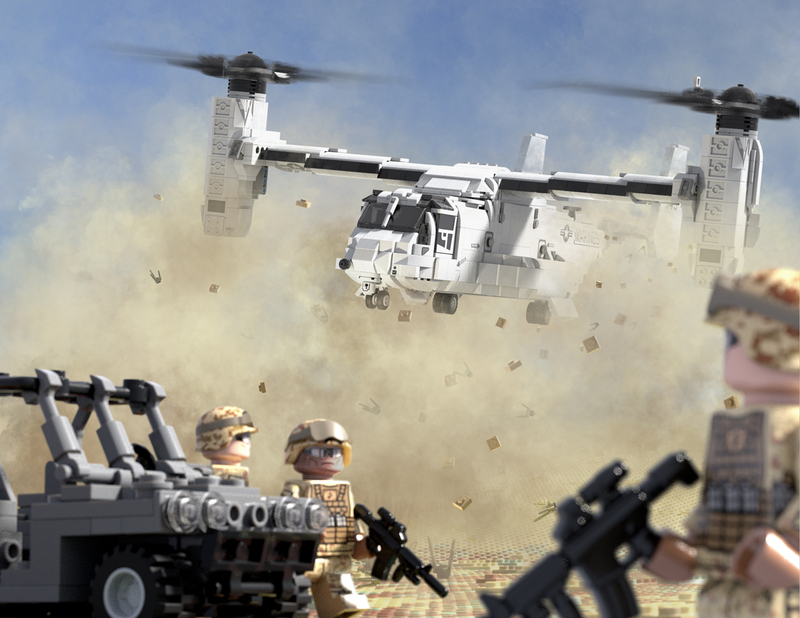 This highly-detailed and carefully designed Brickmania kit features several of the key components of the MV-22 Osprey. Rotating nacelles on each end of the wing house the signature rotors that rotate in tandem in opposite directions, just like the real Osprey. The entire wing and rotor apparatus collapses for carrier stowage. The model also features moveable flaps, rudders, and elevators, along with retractable landing gear. Designed with a removable roof, the builder will find a detailed cockpit and room to place the M1163 and towable mortar, both included in the kit. Two pilot minifigures, custom-printed elements, and a high-quality sticker sheet are also featured with the kit.